“If Bob Ross Wrote Graffiti” new series! Winter did not want to let go this year during the painting of my first ever big canvases. Now they are completed and we can usher in the sunshiney days. 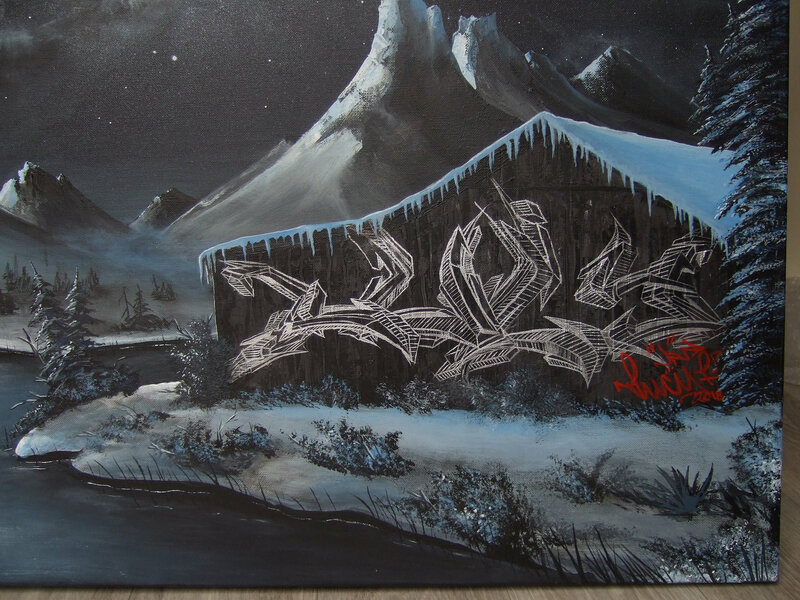 If Bob Ross actually wrote graffiti, and painted a landscape, what would it look like? It is the second set in the series (If “fill in the blank” Wrote Graffiti”) which explores other artists, the first one being the gigantic Dali mural inside Crawford Steel in Chicago, appropriately entitled, “IF DALI WROTE GRAFFITI” (2012). There will be more artists featured in this manner, as it is quite fun challenging myself with this type of criteria when painting. In graffiti terms, this is called “biting” aka copying someone else’s style and it is typically frowned upon. 😦 Clearly, I don’t care. If you want to see a wealth of photos of the entireeeeeeeeee process, and delve into the artist’s psyche, than please visit my Flickr album. The first photos are the final ones, plus a lot of close-ups. This silver ink does not exist anymore unfortunately. Glad I scored some when I did in 2012. If anyone knows of a suitable alternative, would be glad to know it (please leave comment below this post). On the back of the second painting (#2), I attached a quote by Steven Hawking, who passed away during the painting of this piece. Felt that this quote from such an inspirational person was just perfect to go with this painting. 2018 — is proving to be the Year of Lucy even more than last year. If it seems like I am celebrating a lot, it’s because there is much to celebrate lately. Initial image I made to pitch the idea. Bob Ross getting down on frosty mountains on a black canvas. Update – The Twins are in Chicago! >>>>See blog post. Next Because unicorns do actually rule! Pingback: The Twins are off to Chi-Town!